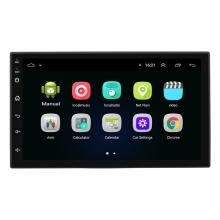 Quad-core + for Android 8.1 GO system + mobile phone interconnection function + GPS function + wifi Internet access function + AM / FM / video output function + steering wheel control function. 1G DDR3 running memory, 16G storage memory. Built-in WIFI, support WIFI hotspot. Built-in GPS navigation function, can be equipped with a global map. Built-in radio function, FM (18 radio) AM (12 radio stations). Multi-format audio and video decoding, 1080P full format support, up to 4K video playback. Support for rear view camera input. Support for driving recorder function. Video input function, video output function.